Adorable video of a hamster doing a miniature agility course. Q: What time of day is best for playing with my hamster? A: The best time of day to play with hamsters is in the evening, because hamsters are nocturnal (awake at night). If you wake you hamster up during the day, you’re likely to get bitten. Q: When is the best time to play with my hamster? 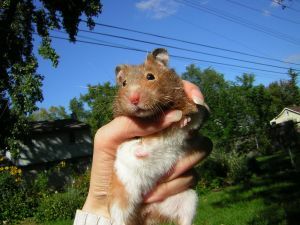 A: The best time to play with a hamster is in the late afternoon and in the evening because hamsters are nocturnal. If you try to awaken a hamster during the day, you might be greeted with a nip!